I will be unveiling the whatsapp plan activation/subscription codes for MTN, Etisalat, Airtel and glo networks in this post. Whatsapp is now part of our life as it has replaced even the normal SMS provided by network operators. No one sends SMS now as whatsapp covers that at a very affordable rate. To know how important and useful whatsapp is, just imagine how you will feel if whatsapp is carelessly deleted from your phone. Am sure you will run crazy as it's among the most cherished apps on everyone's Smartphone. Whatsapp was launched in 2009 and since then, it has recorded over 1Billion downloads and according to an official whatsapp statement recently, closely 1million people register on whatsapp on daily basis and billions of messages are sent on the platform. Now back to our main focus which is the whatsapp bundle plan for all networks in Nigeria. I noticed that some people; due to one reason or the other are unable to subscribe for normal data plan at a particular time but still want to be connected with friends and relatives via whatsapp chat at the possible cheapest price. That's why am bringing this post so you can select the best and cheapest whatsapp bundle that fits you. 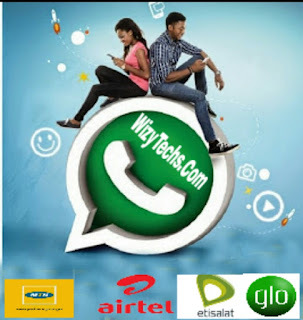 bundle for Whatsapp users on the MTN network in Nigeria, this plan offers unlimited use of whatsapp at a cheap and affordable cost. Subscribers can either subscribe for the weekly plan or monthly plan which costs #25 and N60 Naira respectively..
✔ Simply text WAW to 131 and you will receive a welcome message for the bundle. It valid for 7 days. Unfortunately, Glo doesn't have any whatsapp plan at the moment (i might be wrong though). Even on their website, there is nothing like that yet but i will keep you guys updated as soon as it's available. In conclusion, you can see that MTN offers the best whatsapp plan among all the networks, followed by Airtel. Etisalat plan is a bit expensive but considering you can also use it with Facebook messenger, 2go and WeChat, it makes a little sense sha.